Tag Archive | "Crash fatalities"
About 90 people die each day from motor vehicle crashes in the United States, resulting in the highest death rate among 19 high-income comparison countries. Our nation has made progress in road safety, reducing crash deaths by 31 percent from 2000 to 2013. But other high-income countries reduced crash deaths even further—by an average of 56 percent during the same period, according to the latest Vital Signs report by the Centers for Disease Control and Prevention (CDC). third lowest front seat belt use (87 percent). If the U.S. had the same motor vehicle crash death rate as Belgium—the country with the second highest death rate after the U.S.—about 12,000 fewer lives would have been lost and an estimated $140 million in direct medical costs would have been averted in 2013. And if the U.S. had the same rate as Sweden—the country with the lowest crash death rate—about 24,000 fewer lives would have been lost and an estimated $281 million in direct medical costs would have been averted in 2013. For this Vital Signs report, CDC analyzed data compiled by the World Health Organization (WHO) and the Organization for Economic Co-operation and Development (OECD). 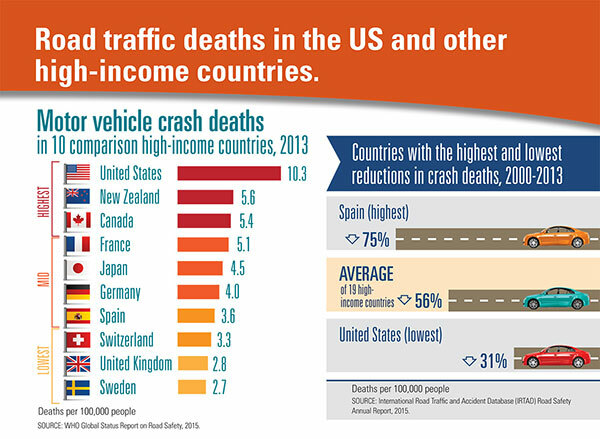 CDC determined the number and rate of motor vehicle crash deaths in the U.S. and 19 other high-income countries and reported national seat belt use and percentage of deaths that involved alcohol-impaired driving or speeding, by country, when available. Countries included in the study were Australia, Austria, Belgium, Canada, Denmark, Finland, France, Germany, Ireland, Israel, Japan, Netherlands, New Zealand, Norway, Slovenia, Spain, Sweden, Switzerland, the United Kingdom, and the United States. Each country included in the study was a member of OECD, met the World Bank’s definition for high income, had a population of more than 1 million people, and reported the annual number of motor vehicle deaths and vehicle miles traveled. In addition, the difference between the country-reported motor vehicle crash death rate and the WHO-estimated rate could not exceed 1 death per 100,000 population. CDC’s Injury Center works to protect the safety of all Americans, every day. For more information about motor vehicle safety, please visit www.cdc.gov/motorvehiclesafety.